An attorney and an architect walked into the Jockey Club. In fact, it appears one of them lived half his life there for a while. Philip E. Orbanes writes that the Uruguayan attorney, Segundo Santos, had become addicted to Bridge some time in 1939. 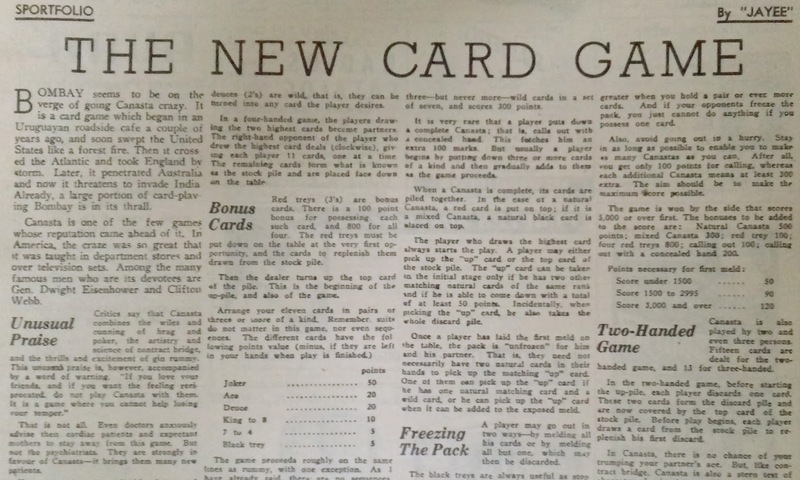 He decided to switch to something lighter and with his friend, Alberto Serrato went on to invent a game called "Canasta" -- "a combination of the best elements of Bridge, Rummy, and a Rummy variant called 'cooncan.'" Canasta is the Spanish word for "basket", and the origin of the name is attributed by Orbanes to an act of whimsy. 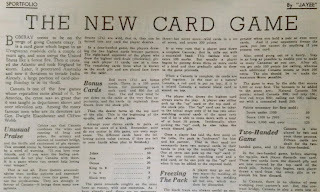 The Illustrated Weekly of India reported on 18 March 1951, that the game had hit Bombay, and it like in many other great cities before it, had swept through the city's card-playing community. As a non-card-player, I have often wondered at these phases that the communities of players seem to go through. Is it possible that the game-fatigue is perhaps not realized until something fresh suddenly appears on the horizon behind the hands they hold? I like thinking of how games travel -- of the figure of this magician, who cannot suggest something too unfamiliar to the players for then they may be taken for an outsider. Yet they know how to defamiliarize the familiar, how to make the shapes and numbers dance to a subtly different tune. "Jayee," who wrote the Sportfolio column(bad puns are as old as language), reported that the "card game which began in an Uruguayan roadside cafe a couple of years ago, and soon swept the United States like a forest fire" has a "large portion of card-playing Bombay...in its thrall." It seems s/he had taken the trouble of learning that game, declaring it as a reasonably easy process. Among the game's most famous devotees, Jayee lists Dwight Eisenhower and Clifton Webb. Is the game still played widely in Mumbai? Canasta seems to have reached Houston, via a few India exponents of the game.